Coastal temperate rainforests in British Columbia and Alaska store a shocking amount of carbon. Carbon is the element of life. Cycling through countless compounds, from simple carbon dioxide to complex carbohydrates, carbon makes life possible. Given its importance, scientists are constantly trying to track how carbon is stored or released from one system to another. Recently, scientists found that the soils in the temperate rainforests punch well above their weight when it comes to their carbon storage abilities. This means we can’t precisely model future climate change before we look underground. 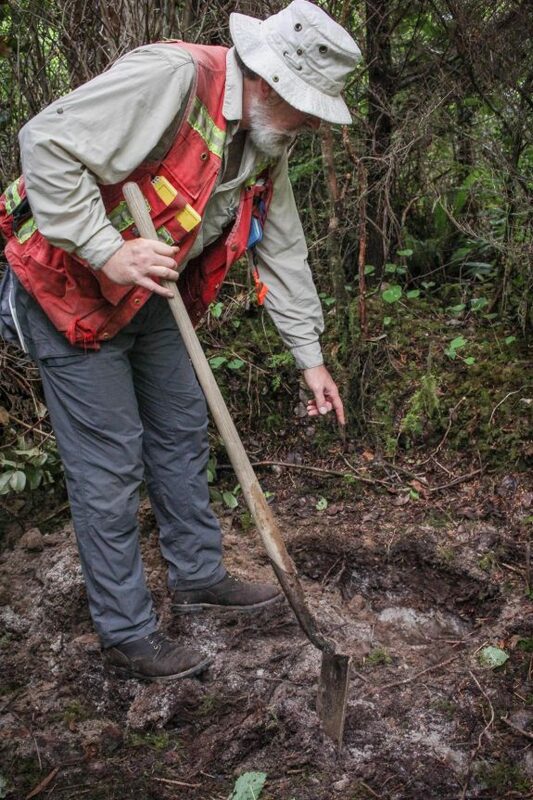 To calculate how much carbon is stored in the temperate rainforest soils of western North America, scientists created a database of over 1,300 soil test pits from across the coasts of Southeast Alaska and British Columbia—an area larger than New Zealand. 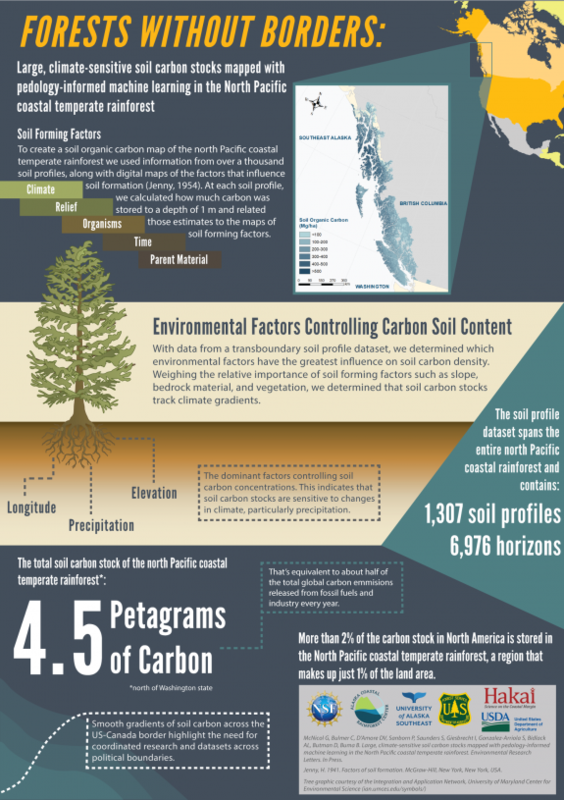 Scientists measure the amount of carbon stored in soils in petagrams. How heavy is a petagram? Just one petagram is an almost unfathomably large one trillion kilograms, about the same mass as a cubic kilometer of water. When McNicol and colleagues extrapolated the total carbon stock from all of the soil pits, the final number was staggering. Soils in these coastal rainforests store four-and-a-half petagrams of carbon. In other words, more than two percent of North America’s carbon stock is stored on less than one percent of the land area. Four and a half petagrams is equivalent to around 50 percent of the total global carbon emissions in 2013. But it is not just the final number that will prove valuable for climate science moving forward. The study also shows that carbon stocks change dramatically from place to place. The wettest areas store at least three times as much carbon as the driest areas, which can now be pinpointed on a map. While it is helpful to think big, we can also learn a lot from soil studies that focus on much smaller areas. “The rainforest is not one homogenous thing. You see different patterns at different scales,” says Giesbrecht. At Hakai’s Calvert Island Ecological Observatory, scientists seasonally tracked the smallest living things—microbes and fungi—that process carbon in the soils. The diverse microbe community in temperate rainforest soils facilitate carbon recycling, breaking down organics from plant and animal debris to basic nutrients that can be used as food for the next generation, both on land and in the coastal oceans. Recently published in the microbiology journal ISME, an international team of scientists led by David Levy-Booth revealed a previously unknown seasonal cycle in the soil’s microbes. Bacteria in the soil became more or less active depending on the conditions. In response to wetter conditions, soil bacteria converted more carbon and hydrogen into methane—another potent greenhouse gas. As the regional climate changes, it will be critical to understand how soils and their microbes will respond and their effects on the coastal rainforest as a whole. “The two papers together illustrate complexity at the scale of an entire region or a single hillside,” says Giesbrecht. When it comes to studying climate change and coastal food webs, we’ll need to think both big and small.